All that remains for us now is Kel'thuzad, and after hours of attempts, we agree with the other guilds that he is very likely unkillable in his current state, without better gear and/or world buffs. Stay tuned for week #2! Want to be part of Risen for our first Kel'thuzad kill, and whatever is in store for us beyond that? Now is the perfect time to apply! If you feel that you're a skilled and dedicated player, we'd love to hear from you. Recruitment is currently open to all classes. Post an app on our forum, or message me in-game! The date has finally been set! Kronos Naxxramas will be opening Saturday, October 21st at 7pm server time. That leaves us a little over a month to prepare for the last--and what should be most epic progress race that the server has ever seen. We were the first North American guild to clear AQ40, but we weren't happy with just that. We want to compete for server firsts, and that means stepping up our game for the most challenging raid content that vanilla has to offer. Are you a skilled North American player who wants to experience what a true progression race is like? Sick of feeling like you're one of the few competent players in your guild? Worried that you won't even be able to raid, because your roster is full of alts from other guilds? Scared that the casuals in your guild won't even realize that there's an attunement required to gain entry into Naxx? If that's you, then it's time to make a change! Risen offers a fun and competitive environment, devoid of alts from other guilds, for those who want to want to push for server firsts, alongside team mates who perform at a high level. We have been around on Kronos for over two years now, and are one of the most stable, well-organized guilds out there. If you're a North American player who wants more than what your current guild can offer, then we should be at the top of your list. What are we looking for? As I said, skilled and dedicated players of ALL CLASSES, who perform at a high level, and will put in the time and effort to prepare adequately for the race for server firsts. If that's you, then I urge you to apply immediately! Even if you're currently undergeared, or aren't even level 60 yet, I'd still love to hear from you. If you have any questions, please message shard in-game, on Discord, or in a private message on this forum. if you're ready to submit an app, please head over to the recruitment forum! Looking forward to seeing you with us for Naxx! As the (eventual) release of Naxx approaches, our preparations are heating up, and that means rounding out our roster with people who, like us, are extremely excited and are heavily anticipating another opportunity to compete for server firsts--in the greatest raid Blizzard ever designed! Are you a competitive person, who strives to be the best at whatever you're doing? Unhappy with your current guild's lack of stability, or dedication? If so, then we might be the right place for you. Risen has been on Kronos for going on two years now, and we're proud to offer our members a well-managed, stable, and competitive environment. 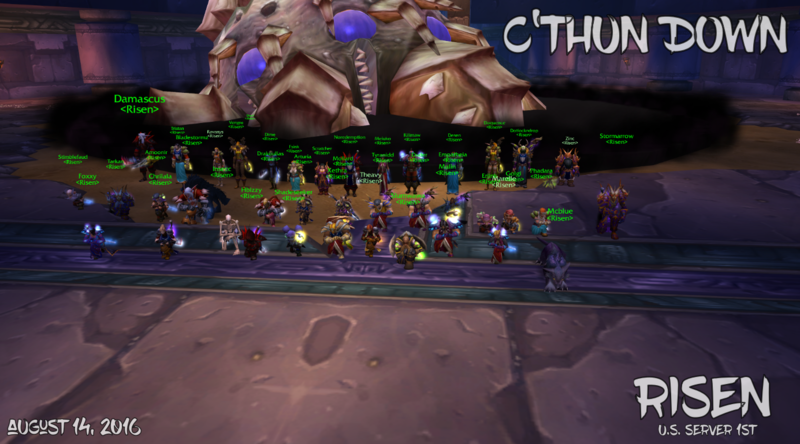 We were the first North American guild to kill C'thun in AQ40, and our goal is do even better than that in Naxx! Now is the time to apply, and earn your spot for our Naxx progression group! Even if you've never raided before, are undergeared, or aren't even 60 yet, that doesn't mean we won't want you. I am very open to giving people a shot to prove themselves, so if you feel that this is the right guild for you, just go for it, and submit an app (or talk to me in-game)! If you want more information, pst me in-game, or go check out our Recruitment tab. If you want to start working on your application, head over to our recruitment forum. If you want to apply discreetly, you are always welcome to send your application via private message to me. We didn't get there quite as fast as Synced or Vanguard (grats to them), but after half a dozen server restarts, and several hours of frustrating lag crashes, we managed to snag the NA first kill of the big tentacle dude! Props to the Kronos team for making it 99% blizzlike. Currently recuiting all seriously dedicated players who are active on Kronos every day, and who want to be on the forefront of Naxx progression (when it eventually is released). Always recruiting exceptional players of any class. If you're a good player, and a good person, we'll find a way make room for you. Hosting BWL and MC pugs! Please make sure you read the rules and requirements before you sign up. After doing that, all you need to do is register an account, and then post your character name and desired role (tank/healer/dps) in the thread. If you meet our gear requirements, and we need your desired role, I'll add you to the roster, and you'll be set to go. If you have any questions about anything, please pm me in-game.